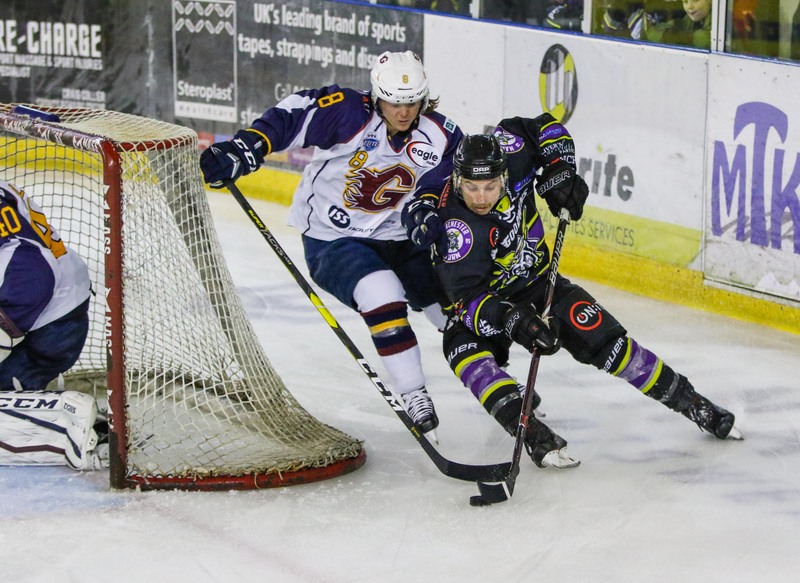 MATCH REPORT: Storm Extinguish the Flames at Home! Storm were first in the penalty box last night, as Ruopp sat for a delayed hit just 27 seconds in. Hopes of a powerplay goal for the Flames fizzled, as just under a minute later, Dunbar sat for hooking at 1:03. Storm then took a bench penalty for too many men on the ice at 2:44. The line held up their own on a strong penalty kill, Poulin calling the shots. At 4:37 there was another penalty, this one for high-sticking and Flames’, Craige sitting in the box. Storm took a few chances on the powerplay, getting their shots off on a turnover – denied by Fullerton. The first goal of the evening came at 9:03, when Watters claimed it for Flames, over the blocker of Ginn at 9:03, assisted by Dunbar and Craige. The remainder of the period was relatively clean, the only other penalties going to Springer at 14:08 for tripping and Ackered for Flames, tripping at 17:19. Storm not managing to breakeven, and Flames not managing to claim a second. It was like deja vu of the first period, as Storm took a penalty within the first minute of play, Byers sitting two minutes for tripping 16 seconds into the second period. Things remained at 1-0, as Flames failed to put one past Ginn on the powerplay. The pace picked up, and despite things seeming physical, both sides seemed to get away without any calls. It wasn’t until the final ten minutes of play that there were more penalties – Moffatt receiving two minutes at 32:01 for roughing and Bakker for slashing at 33:42, giving Flames an opportunity on a short 5 on 3 powerplay. The second Storm went back to four skaters, Flames scored goal number two, scored by Ferguson and assisted by Ritt and Foster at 34:05. In a turn of events, Storm got a goal back just one minute later, their first of the evening, assisted by Moffatt and Hammond. This goal snook in on the back post and had to be reviewed. Storm found even more momentum from then on, as Poulin took his chances with a long shot and Richardson on the breakaway. The final few minutes were tense, as Ruopp was handed a two minute minor for charging and Byers for unsportsmanlike conduct, both at 37:40. This gave the upper hand to Flames, but they failed to claim another goal, with what was a strong Storm penalty Kill. The second period flowed more than the first, with less penalties and some fast, competitive hockey – both netminders pulling off some excellent saves throughout. It wasn’t long until Storm found a way to equalise, as Ehrhardt scored just 40 seconds in with a shot from the blue line, assisted by Richardson and Linsmayer. At 42:00, Bakker took what was the final Storm penalty of the evening for charging, luckily Flames not managing to get one up on the scoreline. Flames final penalty of the evening went to Ferguson for tripping 46:43. It was clear that both teams really wanted to take the win and avoid overtime, as play went back and forth, hardly any stops in play – both netminders having a solid game. At 56:35, it was Hammond who found a gap and slotted the puck through Fullerton’s five-hole on a one timer, assisted by Ehrhardt and Springer at 56:35. In the final minute of play, Fullerton was pulled in favour of an extra player. However, it was Hammond’s game winning goal that sealed the victory in the Storm Shelter, winning 3-2 after being 2-0 down for 35 minutes. Man of the Match for Guildford Flames went to #27, Ian Watters. 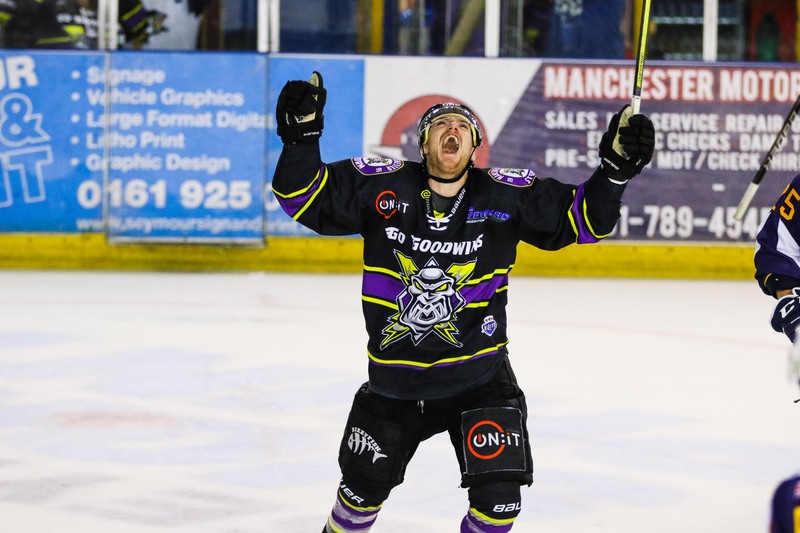 Man of the Match for Manchester Storm went to #21, Mike Hammond. Referees: Tom Pering and Andrew Dalton. 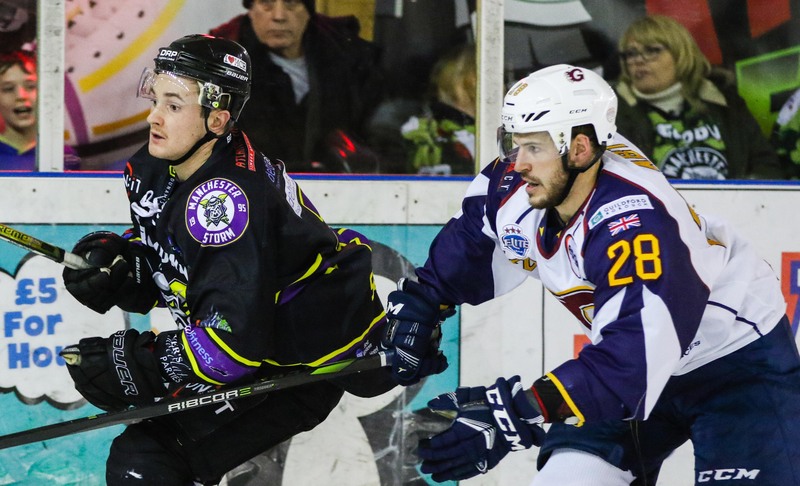 The next home Storm game falls on Saturday 24th November, as last season’s league and playoff winners – Cardiff Devils, visit the Storm Shelter for the first time this season! You can check out the Storm’s fixtures here! The club’s OSC are hosting the Storm’s Christmas Party, Tuesday 18th December at Cresta Court Hotel, 19:00 – late. Email events.stormosc@gmail.com to book, or visit the OSC desk under block 113 on match nights.